For some people, music is a form of escapism, and for others, a rite of expression that can both repel the bad and enhance the good. Given the heavy-hearted election season, many needed that same medium to be an getaway — even if it was just for one night. Madison Square Garden was full of romantic couples, some maybe weeks into their union and some that had been together a long time before. This was the King and Queens of Hearts tour, co-headlined by R&B singers Maxwell and Mary J. Blige. Blige’s career has been bookmarked by her own sense of perseverance and strength. 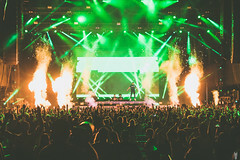 Her set list was indicative of the current pain she was going through, recently filing for divorce from her longtime husband, Martin “Kendu” Isaacs. Her opening backdrop was a collage of the instances she had overcome. Like any point in her career, she bared her soul and the fans resonated with it. “Ya’ll see me go up and down, the thing I learned was to accept myself,” Blige proclaimed to a receptive crowd. 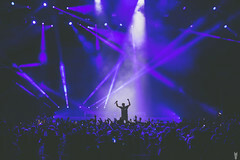 The hour-long set was emotional, as Blige had to fight through tears through 1994’s My Life cut, “I’m Going Down”, and Waiting to Exhale‘s own “Not Goin’ Cry”. To be honest, it was hard to see how she kept it together, but even with the bad, there are happier moments. Method Man joined Blige on stage for their 1995 collaboration, “You’re All I Need”. “Family Affair” brought about dancing and celebration, which could also be a microcosm of Blige’s life — in fact that you have to still dance within the rain. 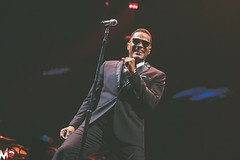 A huge disco ball was lowered as a sharply dressed Maxwell began singing “Dancewithme” off of 1996’s Urban Hang Suite. If you have never been to a Motown show, this was a close look at what a show in that time frame would have been. 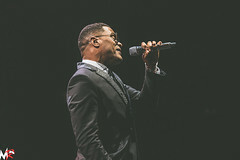 The singer, now 43, is a tent pole of smooth R&B who still has a vast audience today. 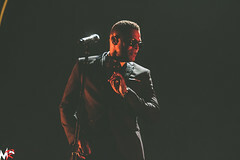 “Bad Habits”, the fourth song performed from his recently released BLACKsummers’night made full use of the backing band as the sultry song was dripping with keyboards, trumpets, and Maxwell’s harmonies. 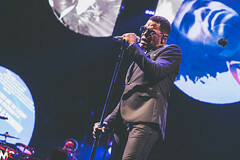 Mid-set, one of Maxwell’s most well-known songs, his rework of Kate Bush‘s “This Woman’s Work”, was introduced by her version briefly played on the screen. A single spotlight shined down on Maxwell as he kneeled down listening to the words. After that, the piano keys crashed into his falsetto while couples began to clutch each other tightly. “Ascenscion (Don’t Ever Wonder)” is almost a rite of passage within the all time great R&B songs and the entire arena sang the chorus along with the singer as he smiled and stood front and center of the ramp. 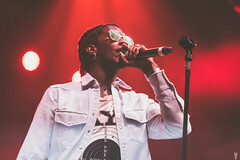 With music being the huge smorgasbord of genres that it is right now, some wonder if classic R&B can also get a piece of the pie. The King and Queen of Hearts tour showed that where there are lovers, there will be the music to follow.